Vendredi: Bienvenue à Paris, Salle Gadaski. Met up the rest and everyone’s relaxing outside somewhere near our hotel. It’s Happy Hour for drinks. “No thanks” we said, “We’ve come from London.” We really just wanted something to eat. But apparently, late afternoon wasn’t the appropriate time for it. None of the places were serving food apart from a Norwegian fish restaurant which looked ominously empty. But the food was, in fact, very good, matched with a nice Muscadet although five kinds of herring in one plate is a lot of herring. Our first lesson. Unlearn sport fencing. This is Escrime Artistique; big movements, jumps, signal your intent and try not to hit anything. Lessons were conducted in French. Cue lots of bewildered Londoners (a practiced look for some of our Euro-trotting fencing lot by now) trying to follow important instructions that helped you avoid whacking your partner’s shin or getting your ears sliced. No mask, no armour. Fortunately, Olivier spoke good French. There was a lot to learn in the short time we had, dozens of moves. A blend of epee, foil and sabre thrusts and cuts. Routines and terminology were to be remembered. Later on, we had our sketches to memorise. After the first session, our plans to go out and have our big evening, as advised, were scuppered by rain. Sought refuge in a nearby restaurant which turned out to be Italian. Their kitchen was closing but we managed to get cheese and a magnum of red wine. Had little luck with progressing through the evening though and ended up for last cognacs at a nearby bistro. A day of practicing on a stage. Tricky stuff but we were starting to get the hang of things. Olivier said for dinner we should go to Montmartre. We arrive climbing about 600 steps from the underground. Olivier insists we need to find a restaurant with The Editor’s choice special sticker on the door. While we play with flowers in a bar he goes off and finds a Hungarian place around the corner from the tube. It’s a set menu and it includes the Galouschki. We order obediently. The food comes in less then an hour. It is served by the owner himself. He has a huge Hungarian cavalry style moustache. There is his birth certificate on display in the loo – he had a famous great granduncle, Bela Lugosi, the original Dracula of the silver screen. The loo is decorated with love and melancholy. There are the owner’s b/w pictures as a boy, then as a bearded hippy, and later as an émigré…We finish the food and the vodka. We leave and he runs out onto the street to stop us. He holds a 100 euro note. He says we left too much tip. The cavalry moustache smile. Dimanche: Tous pour un, un pour tous. Tried not to be late again for lessons on the last day but failed. Lame du Marais and Salle Gadaski later sat for lunch at the Philosopher Restaurant (finally, a French one!). One end of the table had a bout of arm wrestling while the other had an enthusiastic organisation of the bill payment. Our mid-day meal was followed by tour of the nearby area. We visited Park Vosages which was used by real duellists in the past. It was rather dramatic, rain was pelting down while the music of Mozart was playing in the air in a park where honour was once fought for between individuals. Our last session was held at the Mairie de Paris on the kind invitation of the directrice there. We were given a tour of the art school including a room where the musketeers used hold their lodging. Servants, we were told, would sleep on the beams of the roof. 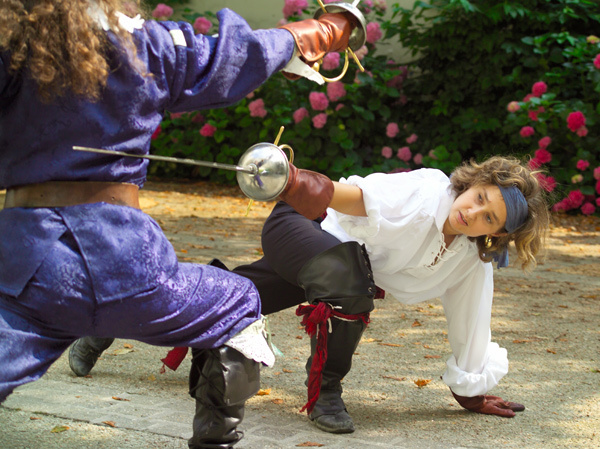 Our fencing would take place in the school’s courtyard and fortunately, the rain by this time had made way for the bright Parisian summer. 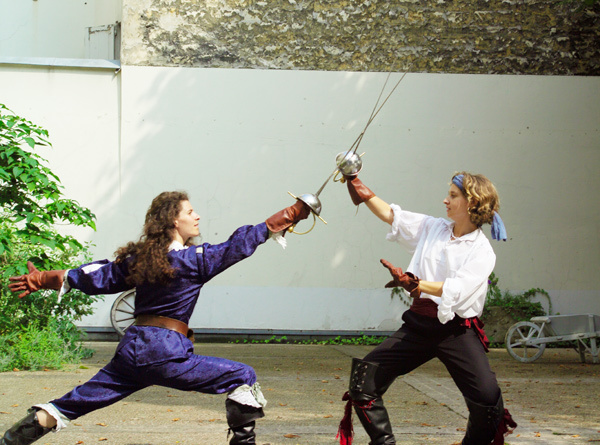 Fencers in musketeer uniform added to the atmosphere of the place. By the end of the day, we’d be putting up a show for the small audience that was invited. Alain, Agathe and Helene put up a great looking demonstration with the two ladies fighting Alain with a sword in each hand. 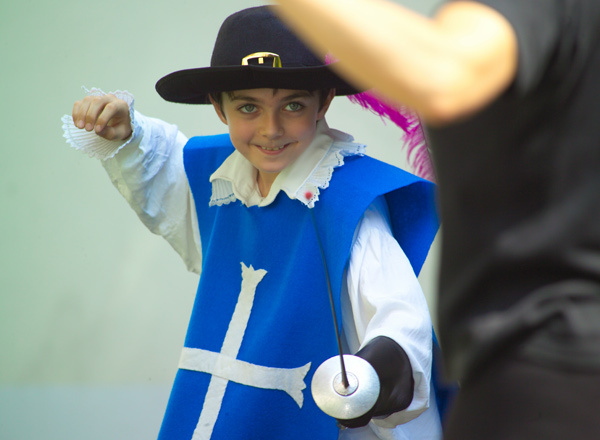 The younger fencers put together an enthusiastic and elaborate show. 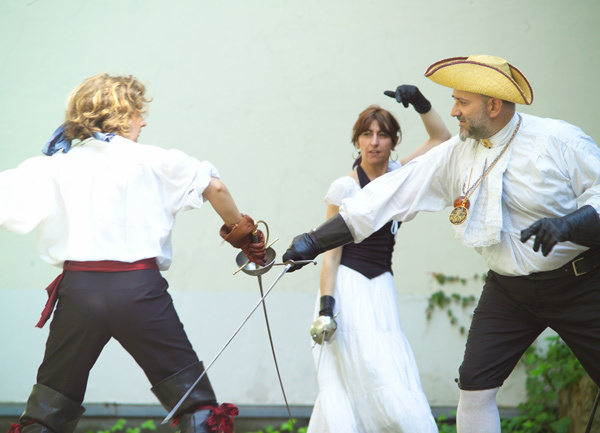 Sarah had also learnt fencing techniques to fend off two opponents, Lee and Ian. The photos of their sketch wrote its own script. Louise and Olivier mixed their fencing with a tango dance accompanied by live opera singing providing a musical backdrop, courtesy of Ian. Yu and myself decided on a sketch with her as an oppressive landowner and myself as a resting peasant. A wheelbarrow that was previously artfully arranged in the corner was commandeered for the purpose. It provided an unexpected comic moment during rehearsal when my concealed sword remained steadfastly stuck to it. To conclude the show, we performed the solo that Marie-Clemence created specifically for Salle Gadaski and then the traditional musketeer salute before exiting stage left. All in all, it was a fun, laidback and cultural weekend. We were reluctant to leave Paris after such a short stay with the city in a relaxed summer mood. But with the French capital being easier to get to from London than a lot of English towns, we were sure to see it again soon enough. Solo pour Salle Gadaski:Coupé figure, Couronner revers, Piston, Recover seconde, Passé arrier tierce, Passato soto, Sauter, Passé avant, Coupe tete, Moulin tete fente, Recover, Salut. Pictures: Lee, Roy, Ian, Olivier. Hit but do not hit! 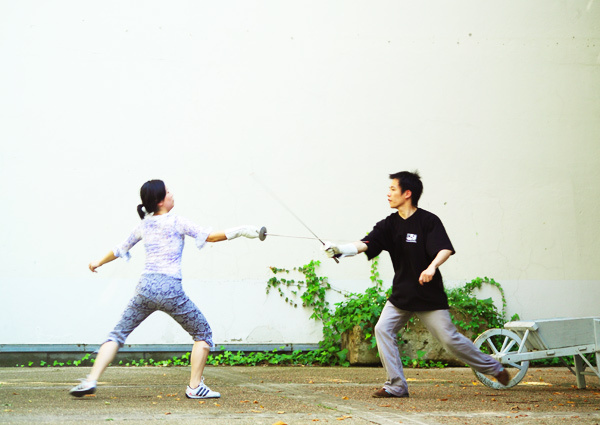 London Fencing Club is the best and the busiest fencing club in the UK providing coaching and training facilities for more than 300 regular members and hundreds of adult beginners. We also offer fencing classes for children, after school clubs and team building events. 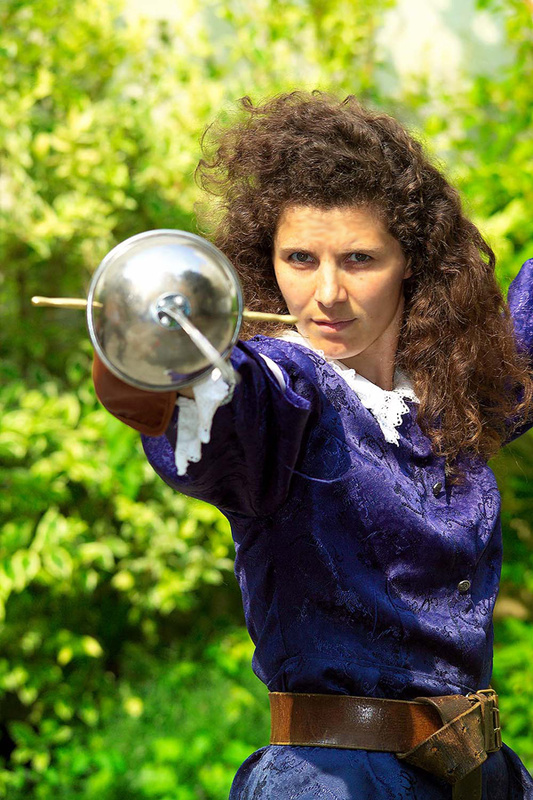 The Club employs eight Fencing Masters of the highest calibre.